A couple of months ago we made one of the best single decisions we have ever made at Cambridge English. It wasn’t a business decision or an educational decision, but rather, we decided to buy a robot vacuum cleaner for the classroom. Our school consists of a single space divided into classroom and reception area. There are no stairs or different levels. The classroom area is carpeted. Students remove their shoes when they come into the reception and go into the classroom in their socks or bare feet (we don’t provide slippers). We have 20-70 students per day coming into the school, so we found it was necessary to vacuum the room at least once a day, sometimes twice a day. This would take 10-15 minutes depending on how thoroughly it was done and how dirty the room was. Eventually we decided to try the robot vacuum cleaner and whether it worked for us. We choose the iRobot Roomba 770 after reading online reviews that said that the model up (the 780) wasn’t really any different from the 770. 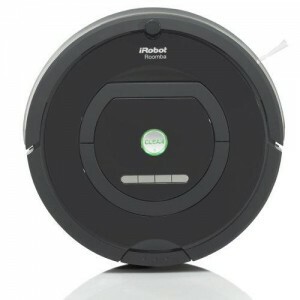 Looking at online reviews, the iRobot 770 and 780 models seem to be much better than previous generations. The Roomba has been fantastic. It runs for 60-90 minutes a day (we set it to run at night when no-one is there), and although it is not as powerful as a regular vacuum cleaner it runs so much longer that it gets the room much cleaner once it has been running for a week or so. It is small enough that it can clean under the sofa and it manages to navigate our crowded classroom without too much trouble. It returns to its charging cradle automatically. We don’t have to vacuum anymore. This was huge. It is so nice to leave the classroom in the evening and come back to a spotless classroom the next day. It works on a timer so can be set to run when the school is empty. The classroom is much cleaner. The automatic vacuum cleaner is much more thorough than we were. It is very expensive compared to regular vacuum cleaners. You have to empty the dust box every day and clean it (5 minutes or so) once a week -this isn’t particularly onerous. The floor has to be clear, so things have to be tidied away and chairs put up on tables before running the machine. It occasionally gets stuck (but this is rare). *Not a problem for us, but the Roomba cannot navigate stairs or uneven surfaces. This has been a godsend for us. It has eliminated vacuuming after lessons or before lessons, neither of which I enjoyed. At the end of the day the last thing I want to do is get the vacuum cleaner out, and I find it a terrible start to the day too. The classroom is really clean, which is especially important when you have young children coming in. I wouldn’t recommend it for a home, unless you have pets, a lot of carpets, or a lot of people coming and going. The real benefit is the fact that it is doing a thorough cleaning every single day. We definitely don’t need one at home, but for the highly trafficked carpeted classroom it works very well. Anyone else have a Roomba? How are you finding it? My wife has a dishwashing robot, it’s called Simon. It doesn’t beep like the old Simon machines but it is pretty cheap.